Emmanuel Mudiay scored 16 of his 28 points in the fourth quarter and overtime as the New York Knicks came back to defeat the visiting Milwaukee Bucks 136-134 on Saturday. The Bucks led by as many as 14 points in the fourth quarter before the Knicks stormed back to force overtime. Kevin Knox added a career-best 26 points for the Knicks. Damyean Dotson and Tim Hardaway Jr. each added 21 points, and Noah Vonleh added 15 before fouling out in overtime. Giannis Antetokounmpo led the Bucks with 33 points, 19 rebounds and seven assists. Eric Bledsoe added 27 points for Milwaukee, Malcolm Brogdon had 22 points, Brook Lopez 13, and Khris Middleton and Tony Snell 10 apiece. Gordon Hayward enjoyed his best game of the season, finishing with 30 points, nine rebounds and eight assists to lead Boston past host Minnesota. The Celtics extended their modest win streak to three games, getting the last two on consecutive nights. The T-wolves saw their season-best win streak snapped at four games. The Celtics also got big performances from Jayson Tatum, who scored 19 points and added nine rebounds. Kyrie Irving also chipped in with 21 points and nine assists. The Timberwolves were led by Karl-Anthony Towns, who posted 20 points and nine rebounds. Andre Drummond tipped in misses on consecutive possessions in the third quarter to stall a Golden State comeback, and host Detroit eased away in the fourth period over the two-time defending champions in Stephen Curry's return to action. The former two-time NBA Most Valuable Player had 27 points, five rebounds, three assists and two steals in 37 minutes after having missed 11 consecutive games with a strained groin. He shot 10-for-21 from the field, including 3-for-9 on 3-pointers, and committed seven turnovers. Blake Griffin led Detroit with 26 points, while Drummond gathered a game-high 19 rebounds to go with 16 points. The Pistons led 54-46 at halftime and by as many as 14 in the third period before the Warriors rallied within 78-76 on a 3-pointer by Andre Iguodala with 2:06 left in the period. James Harden scored 30-plus points for the sixth time in eight games, Clint Capela recorded his eighth double-double in nine games, and Houston parlayed a balanced scoring attack into its win over visiting Chicago. Harden led seven Rockets in double figures with 30 points, doing so on 9-for-16 shooting. He finished 6-for-11 on 3-pointers, adding six rebounds and seven assists to his ledger. The win pulled the Rockets, who led the NBA with 65 wins last season, back to .500. The Bulls dropped their sixth consecutive game and sixth in succession in the overall series with the Rockets. Zach LaVine paced Chicago with 29 points on 11-of-17 shooting while forward Jabari Parker added 21 points and 12 rebounds. Kawhi Leonard scored 34 points and former Cavalier Danny Green added 15 points and seven rebounds to lead Toronto past host Cleveland. 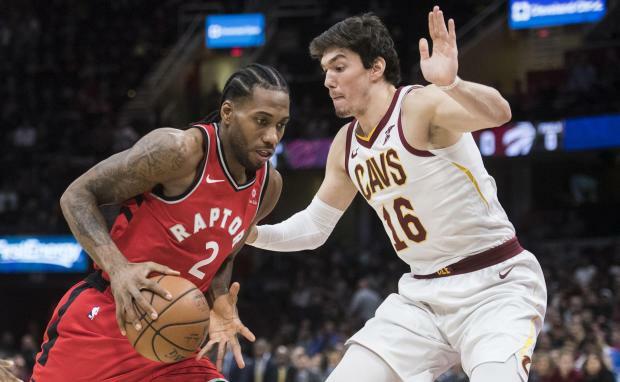 Leonard connected on 11 of 21 field-goal attempts and was a perfect 9-for-9 from the foul line and grabbed nine rebounds for the Raptors, who boast the league's best record at 20-4 and now have won eight straight games. All five Raptors starters scored in double figures. Cleveland, which lost by 33 points on Friday to Boston, was led by Tristan Thompson and Jordan Clarkson, who each scored 18. Clarkson's points came off the bench. Thompson also had 19 rebounds for his 12th double-double of the season and his sixth in the past seven games. Willie Cauley-Stein followed a De'Aaron Fox miss with a dunk with 16.1 seconds remaining to give host Sacramento a one-point lead and the win over Indiana. A 3-pointer by Darren Collison had given Indiana a 110-107 advantage with 1:12 to go before Cauley-Stein stole the ball and Fox made a layup with 35.1 left to get the Kings within one. Bogdan Bogdanovic had a team-high 20 points and Cauley-Stein recorded a double-double with 17 points to go with his game-high 13 rebounds for the Kings, who had lost three in a row. Bojan Bogdanovic led all scorers with 27 points for the Pacers. John Wall scored a game-high 30 points while Bradley Beal got 22, and Markieff Morris added 20 off the bench as host Washington defeated Brooklyn. Both teams were coming off of tough losses Friday. The 76ers handed Washington a 123-98 loss in Philadelphia, while the Nets suffered a 131-125 defeat against Memphis -- in double overtime -- at home. Brooklyn has dropped six consecutive games, while the Wizards snapped a two-game losing streak. Wall also finished with nine assists and five rebounds. Beal and Morris complemented him as the Washington offense scored 60 points in the second half. Allen Crabbe led Brooklyn with 14 points.